Ever wonder why there is so much technical jargon in lending? You’ve got an interest rate and an annual percentage rate (APR). Your payments are calculated with a formula that only an MIT grad could understand. It’s because that’s how lenders get as much money out of you as possible. The jargon isn’t just there to confuse you but to make it more difficult to compare one loan against another. 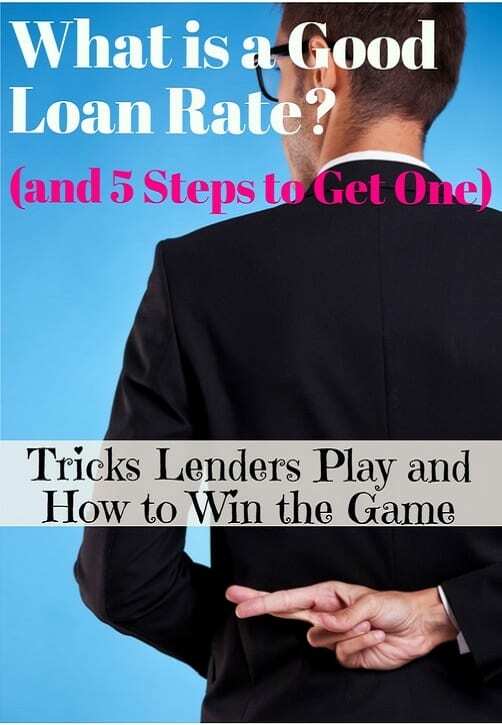 Lenders are the ultimate magicians, holding out a low-interest rate in one hand while hiding a higher APR up their sleeve. Let’s look at what APR means and how it differs from your interest rate before looking at how to get a good APR on three types of loans. The annual percentage rate (APR) is the actual cost of a loan and one of the most important factors to remember when deciding which debt gets paid off first. You see, most people fixate on the reported interest rate for a loan which doesn’t include all the fees and other costs. It’s not a true measure of the interest you’re paying on the loan and usually much lower than the APR. That’s why credit card companies and lenders put the interest rate in big, bold letters while the APR is hidden in the fine print. But APR is the rate credit cards and other loans actually use to calculate your monthly interest charge. Your APR is divided by 365 for a daily rate then multiplied by the average daily balance you kept on the card for the month. That means you’ll owe lots of interest even if you make a big payment on your card but don’t pay it off completely. Let’s look at an example of how this works because it’s something that costs people a lot of money. You find that plush recliner that makes you feel like sitting in a cloud but it costs $3,500…but hey, you only live once, right? That purchase sits on your credit card for 25 days of the 28-day billing cycle before you pay off all but $500 on a card that charges an 18% APR. You’re expecting to pay interest of $7.50 or that 18% annual rate on the $500 you still have on the card but are blown away by the $47 charge on your card. That’s because you had an average daily balance of $3,200 because the purchase was on the card for so long before paying it down. The moral here is, if you don’t think you’ll be able to pay off your credit card at the end of the month, make whatever payments you can as soon as possible. This will decrease your average daily balance and decrease the interest charge you pay on your APR. Remember, ask for your APR any time a lender tells you about a great interest rate they can give you. The interest rate doesn’t include fees like closing costs, origination and annual fees. 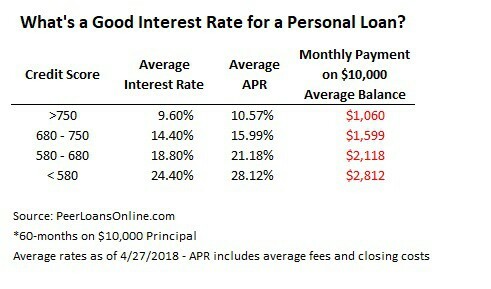 The APR takes all these fees and adds them to the interest rate to show you the actual cost of that loan. The APR is also an annual rate while the interest rate might not be the real rate if the loan is for less than a year. It’s how a lot of shifty lenders get away with charging insanely-high rates. A cash advance lender may only be charging a 15% rate when you consider a $15 fee on each $100 loan…but it’s only for two weeks. That same rate on annual basis, what you would pay if the loan was for one year, would be 390% or higher depending on how you paid it each month! There’s a lot of things that go into an APR for a car loan or any loan so it’s tough saying what is a good rate. I’ve taken data from a lender database as well as other sources to find average interest rates for credit score ranges but your own rate will differ. 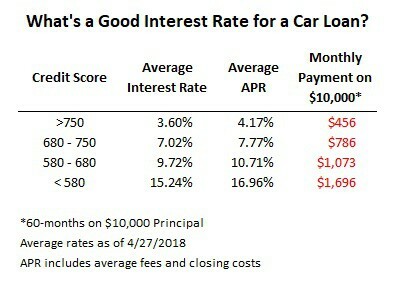 What’s important here is to notice the difference between the interest rate, which the lender will most certainly talk about how low it is, and the actual rate you pay in the APR. Maybe even more important that the rate you can get on a car loan is whether you can afford the monthly payments. Those payments jump for people with bad credit so it might be worth it to fix your credit score for a few months before applying for a loan. A good APR for a credit card is still higher than just about any other loan out there. It might not mean much if you pay the balance in full every month…but how often does that happen? We all say we’re going to pay off our cards every month. Even if it happens most of the time, the interest you pay during those few months when you run a balance really adds up. In fact, most people end up paying roughly twice the amount for their purchases when put on a credit card. That’s after all the interest is added in. Is that new laptop really worth twice the sticker price? 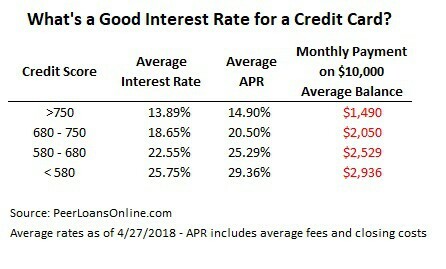 While rates on personal loans are generally below the ones you’ll find on credit cards, they can still get really high. I’ve used personal loans for debt consolidation, saving interest by paying off higher-rate credit cards, and for a home improvement project but I usually try to avoid them unless I really need the money. Unlike credit cards, personal loans usually include an origination fee which will increase the APR on the loan. To better compare the rates on your debt, make sure you use a debt calculator so you’ll know how much you’re really saving by consolidating. If you do decide to consolidate your debt with a personal loan, I recommend PersonalLoans because of its lender network that can help get lower rates. Origination fees are low and even bad credit borrowers can get approved for rates below most credit cards. What is a Good APR for a Personal Loan? Obviously the biggest factor in your interest rate is your FICO credit score and that depends on some factors beyond your control. While I’ve posted a lot of credit hacks here on the blog and have been able to increase my FICO 100 points in a few years, there are some credit score factors like credit history that you just can’t change. There are things you can change in your credit score and APR though to save thousands on your next loan. Your interest rate will be based on a few other factors besides your credit score and report and it’s here that you can do a few more things to lower your rate. Find another income source that you can add to your application besides your 9-to-5 job. Lenders look at debt-to-income so if you can’t pay down the debt then the next best thing is to increase your income. Try getting a cosigner or applying with a spouse. This will add their employment history and other credit factors to decrease the rate. Getting the best APR on a loan means shopping around for the best interest rate and the lender that charges lower fees or origination costs. I’ve included a table of the lenders I’ve used or recommend here but try comparing at least two or three lenders before committing to your loan. Lenders, especially credit cards, have a lot of tricks they can play to fool borrowers into paying thousands in interest. This goes way beyond just highlighting the interest rate and ignoring the APR on balance statements. Be extremely cautious of those teaser rates and promises of 0% APR. I know it’s tempting to think you can get free money and pay it all off before the teaser rate expires but there are so many traps in these offers. Interest accrues during the teaser rate period. If you don’t pay the balance in full during that six months, you end up owing all the interest you would have paid and at super-high rates. If you’re late even one day on a monthly payment or go $1 over your credit limit, that 0% teaser rate automatically resets to a higher rate. It might be the normal rate or it could even be the highest rate allowable by law. Balance transfers are another APR trap played by credit card companies. Even during that 0% teaser rate promotion, transferring a balance from another card or using your card for cash may come at a higher rate. The annual percentage rate (APR) is the true cost of a loan and something you should look very carefully at because it’s often much higher than the stated interest rate. A good APR on car loans, credit cards and personal loans will vary depending on your credit score but there are things you can do to get the lowest rate possible. Understand the difference between an interest rate and APR and watch out for those APR traps.